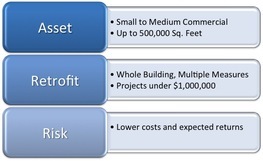 The Energy Performance Protocol for Large Commercial (EPP-LC) is designed for large scale projects that involve whole building retrofits and other projects involving multiple measures with interactive effects where the cost of improvements and size of savings justifies greater time and effort in pre-and post-development energy analysis as well as high performing projects with sufficient savings for pre- and post-retrofit meter data yields where savings are of greater magnitude than noise. Even with these qualifications, the EPP-LC Protocol will not be appropriate for every building. The protocols elaborated here lean heavily toward a whole building metered pre- and post- retrofit data-driven (IPMVP Option C-type) approach. However, such an approach may not be appropriate for buildings that do not have relatively stable fundamental usage patterns – e.g., buildings that are characterized by large and frequent changes in the type of space use, unpredictable and inconsistent schedules. In such cases, alternative methods not covered here may be required. The EPP - Standard Commercial allows for the use of various open-book calculation methods, and rely on partial and full measurement and verification of the energy use and system(s) to which an energy conservation measure (ECM) was applied (Option A: Retrofit Isolation: Key Parameter Measurement and Option B: Retrofit Isolation: All Parameter Measurement). 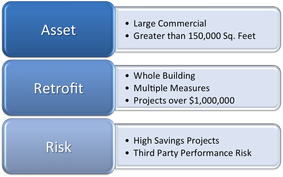 However, these approaches may not be appropriate for buildings requiring a more holistic approach including the use of an energy model to determine energy savings and/or IPMVP Option C: Whole Facility approach for measurement and verification of savings. In the case of a building requiring such a holistic approach. In this case, the M&V protocols found in the EPP-Large Commercial Protocol should be used for these specific components of project development, or in its entirety.